Sick and Elderly: The Pioneers provide help, and assistance to the elderly and sick members of El-Bethel. The Pioneers do what they can to help in each situation, and find community services to provide needed assistance. 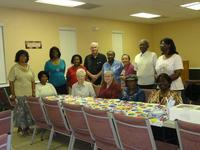 Outreach Program: Pioneers visit homes, nursing homes, and hospitals. They pray for those in need. Youth: The Pioneers serve as role models for the youth of El-Bethel. They offer encouragement, and an uplifting approach to individual youths. Meetings: Every 4th Friday of the month at 6:30 in the Fellowship Hall.